The Center is proposed as a 12,400+ square feet facility designed to both compliment the existing tourism market in Madison County and add significantly to it. 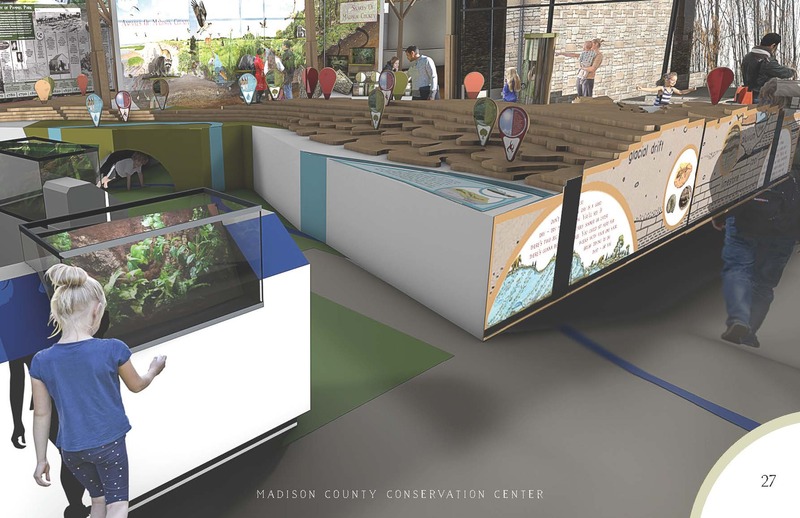 Through interactive features that draw visitors directly to the facility, the Center will launch them into the Madison County landscape for experiences and tourism packages customized to their specific motivations for touring. The Center itself is intended as headquarters for the Madison County Conservation Board and all that exceptional system involves – public nature education, one-of-a-kind outdoor experiences and lasting memories. Few other systems within Iowa or the region hold MCCB’s track record for delivering vitally needed education and attracting the public to the outdoors. Situated at the edge of prairie, woodland and ravine, the Center’s unique location serves as an immediate gateway to three distinct landscapes, appealing to wide-ranging audiences of various abilities. All are welcome here. The Center’s exhibits provide that portal to essential Madison County but the experience inside the Center (while ever-changing and worth repeating) is intended to absorb only an hour of the visitor’s time. The Center then spring-boards the public into the larger “exhibit” that is Madison County. Undoubtedly the world-renowned Bridges of Madison County draw international visitors well beyond the festival weekend. When we enhance the visitor’s experience, the economic benefits reverberate throughout the county. Through Madison County Conservation’s Environmental Center we capture their curiosity, prompt their predisposition to explore and gain the business growth and support that comes with extended stays and return trips. An important responsibility of the Conservation Board is to enrich citizen’s understanding of the ecological systems and natural resources important to our world. It is the goal of the Madison County Conservation Board to be leaders in environmental stewardship and to foster this value and care for the natural world through our Environmental Education program. Environmental education teacher children and adults how to learn about and investigate their natural surroundings with the intent to stimulate them to actively participate in their roles as stewards of their environment. Madison County’s education programs are brought into students’ classrooms, wading through Middle River, hiking through forests, on a tour bus to our various parks and natural resources areas, at community meetings and events, under the stars, in a tent and in our existing nature center facility. Our program generates over 10,000 contacts with students, families and adults annually, by means of a network of local schools, clubs, businesses, community groups, assisted living homes and much more. With numbers expanding each year our educational programming has outgrown our existing facility. Ultimately, the Center will be designed to take full advantage of the landscape for views, light and energy, while nestled into that landscape – as though emerging from it. 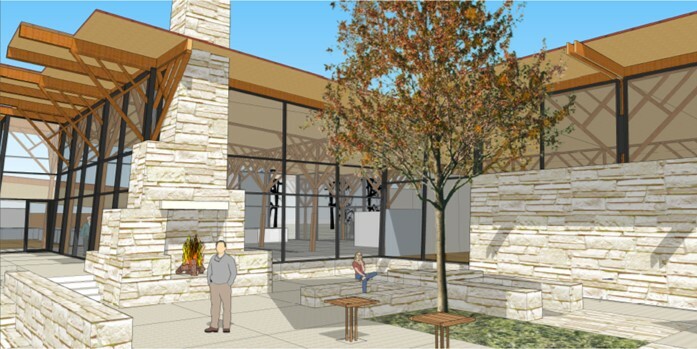 Using natural local materials and promoting all aspects of sustainability to reduce long-term maintenance expenses the Center will bring jobs, social connections and a new focus on Madison County’s natural heritage to the people of this region. The preservation of Madison County’s critical landscapes and habitat require broad public support. Nowhere in the state do we see the same quality convergence of forested river valleys, limestone bluffs and outcroppings, rolling tall grass prairies and dramatic wetland and floodplain habitats. If these distinct land and water complexes are to stand the test of time, people must well understand their benefits and needed protections. Achieving that understanding through powerful learning tools is at the core of the Center’s exhibit and education missions. In a world where sedentary lifestyles rule the day, Madison County plays a vital role in public health. Spending time in nature has been associated with decreased levels of mental illness by reducing depression and anxiety and increasing self-esteem and awareness. These positive effects have the ability to reduce obesity and Autism spectral disorders, and increase calm and curiosity. This center will go a long way toward promoting active living. This facility will serve as a portal to all the unique natural resources that Madison County has to offer as well as provide a hub of information, networking and connectivity with students, families and landowners. Nothing brings vibrancy to a community like dynamic gathering spaces and activity hubs. 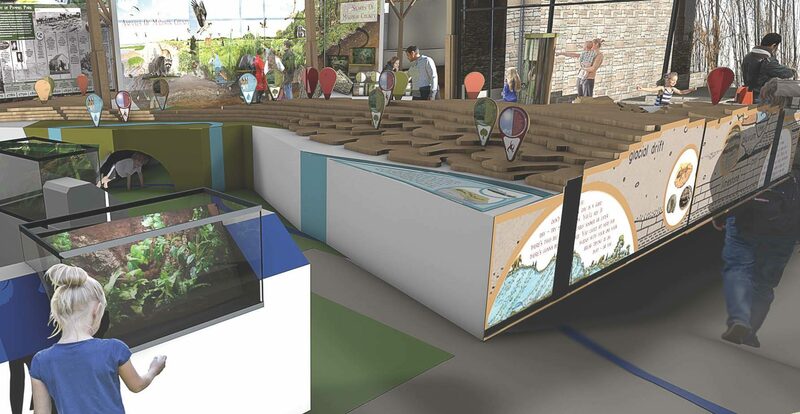 With the unprecedented community room, engaging exhibit spaces and restorative setting, the Center will serve as a community focal point, a critical connector and source of energy for the county — all while tempting the public to taste and embrace the great outdoors.